One cover story from the Vol. 4, No. 11 edition of The Pride is about the dedication of the Cesar Chavez statue on the Cal State San Marcos campus. 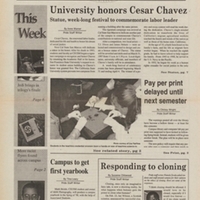 March 27, 1997,” University Archives at the CSUSM Library, accessed April 18, 2019, https://archives.csusm.edu/student-newspapers/record/124.